The Aphrodite Urania Coven is a group of white witches that follow an old Spanish tradition of Witchcraft (Brujeria, or in English, Wicca). Established in Toronto, Ontario, Canada in 1995, the Aphrodite Urania Coven is a descendant of the Isis Urania Coven, with sister covens operating in Montreal (Isis Hathor and Isis Sophia). This coven is a daughter coven of the Isis Maut coven, of Hamilton, Ontario, Canada. As such it follows the tradition set forth by the Isis Urania Coven in 1960, which in turn follows the practices and teachings of the older Spanish tradition, though all work in the coven is done in English. 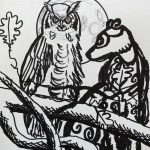 Like other Isis Urania covens, our focus is on The Ancient Harmony, which is the union of the Great Mother Goddess and the Great Horned God and all they symbolize. In less symbolic terms, our focus is on discovering who and what we really are, and building the habits of behaving like That. As a training coven, the Aphrodite Urania Coven is open to accepting serious students of Traditional Wicca for initiation in the three degrees, an introduction to which training may be found in this article from the booklet, Wicca the Ancient Way. If you’re interested in applying for training, please fill out the Contact Us form, by clicking on the “Contact Us” menu item above, or email belmarktoff@gmail.com. Copyright © 2018 Aphrodite Urania Coven. All Rights Reserved.